Federico García Lorca’s rural tragedy Yerma, is a deeply poetic exploration of a country woman’s isolation in mid-1930s Spain, and offers a cutting and emotional critique of Spanish Catholic Orthodoxy while the specter of Franco’s fascism looms; Lorca would be assassinated by Franco’s fascist supporters two years after the premiere of Yerma in his home province of Granada. Theatre Y and Red Tape’s co-production of a new English translation, adapted by ensemble member Héctor Álvarez and directed by Max Truax, is a confusing and perhaps unsuccessful update on Lorca’s classic text. The play follows Yerma, a young married woman who greatly desires a son, and who for reasons unknown, though whispered about, does not have one despite two years of marriage to Juan, a wealthy sheep herder and farmer. Yerma’s world is one that is strictly divided along patriarchal gender lines: men rule the house and labor in the field, and women have children and care for their house and family. Lorca’s world is one that is dominated by Spanish Catholic Orthodoxy, and honor, purity, and piety drive the repressive sexual mores of the village. Throughout the play, Yerma struggles with her lack of children, unsure if she is barren (which is the English translation of her name) or if her husband is, while being unable to find out because she is bound by her marriage. She is pained by the passionless-ness of her life with Juan, and by the unfeeling platitudes of the village in the face of her longing to fulfill the one desire that would legitimize her as a woman. As the years pass, Yerma grows more and more bitter and resentful at her lack of children, and the increasing paranoia and coldness from her husband. She weathers multiple temptations to be unfaithful to her husband, including a passionate longing for Victor, a fellow villager, as the gossip of the village complicates her reputation. 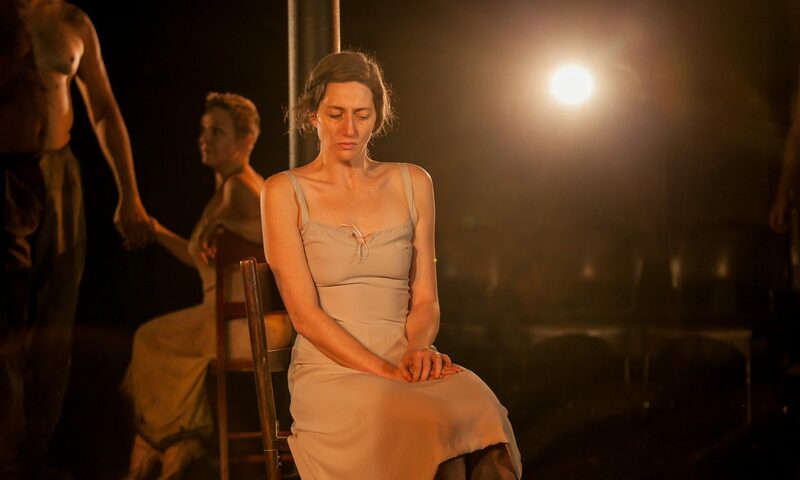 As the play reaches its climax, Yerma is driven by the crushing weight of her husband’s dominance, both over her daily life and the narrative around her childless-ness, to commit a violent transgression, which seals her life-long isolation and abandonment. I had previously attended a production of Yerma in the original Spanish at the National Hispanic Cultural Center in Albuquerque, NM, so when I arrived at The Ready, Theatre Y and Red Tape’s new space, I was interested to see what this new English translation, Chicago produced and directed production would bring. This new adaptation by Héctor Álvarez altered Lorca’s original text in the pursuit of a Yerma that is more immediate and recognizable to 21st century Chicagoans. Truax and Álvarez shift the focus of the play away from Yerma’s relationship to her community and its morals and onto the personal frustration of Yerma’s sexual and maternal desires. While undoubtedly the two are connected, this shift results in the portrayal of Yerma as unsympathetic and unbalanced, and injects inevitability into the violence at the end of the play. Such inevitability seems to undo the work that Álvarez’s adaptation and Truax’s direction purport to do, i.e. critique contemporary toxic masculinity and misogyny.,. It is just as toxic to portray an allegory of women as inevitably violent and unbalanced as it is to uphold a society in which women’s only available options are limited to marriage and childbirth or lifelong celibacy. It seems that this production of Yerma is more interested in skewering men and masculinity and not in centering and uplifting a woman struggling in the midst of immense social pressure, at the cost of Lorca’s existing critique. All of this is not to say that Yerma must be sanitized and noble; however, if her tumultuous emotions and her final transgression are simply a component of her existence as a woman, and not the product of intense social isolation and the resulting emotional stress, is that not in line with the misogyny that Álvarez and Truax seek to expose? Other perplexing choices include the questionable portrayal of one of the village women as sexually deviant, and therefore dangerous, because of her sexual attraction to Yerma. Truax’s choice to have this character portrayed as sexually aggressive and disinterested in Yerma’s consent or personal space sacrificed the legitimacy and reality of LBGTQ sexuality for shock value, while Yerma’s heterosexual encounters with Victor are portrayed as forbidden but entirely mutual. This removes responsibility and onus for social transgression from Victor and places it with Yerma. Throughout the play Victor is portrayed as much a victim of social stigma as Yerma, though then and undoubtedly now Victor’s white cis-male social standing would be completely intact, and his transgression a matter of ownership and not purity and inherent worth. The set and costume design seemed heavily inspired by Pina Bausch’s 1975 choreography of Stravinsky’s Rite of Spring, which Truax would doubtless be highly familiar with, given his training in postmodern choreography. The floor was covered from wall to wall with mulch-like bark pieces, and the women were dressed in simple white slips, the men in trousers with bare chests. Nicholas Tonozzi provided stirring musical composition, and the lighting by Taylor Ovca was splendid. Choreography by Benjamin Holliday Wardell, despite the perhaps treacherous terrain of the space, given that the actors had to navigate the audience being in the middle of the playing space. Wardell’s work translated successfully , as did the fight choreography by Morgan Massaro. The actors all played their parts beautifully as well, featuring Katie Simpson (Yerma), Victoria Walters Gilbert (Dolores), Katie Sherman (Maria) and Barbara Button (Pagan Old Woman) in leading roles. Each member of the chorus and ensemble acted wonderfully, as did Brendan J. Mulhern (Victor) and Cody W. Beyer (Juan) despite some awkwardness inhabiting Lorca’s heightened language. As I left, I did so with many questions about the choices made in this production, though with none as to its stylishness nor with any as to the talent of these actors.